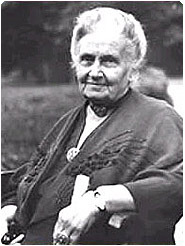 The Montessori Method was developed in the 1900s by Maria Montessori. In Italy, Dr. Montessori's orientation was that of a scientist, mathematician and physician rather than a traditional educator. She based her method on the premise that each child is born with a drive to develop himself. A child learns best from his physical activity and senses if given freedom to discover, explore, create in an enriched environment with supportive encouragement. A common misconception holds these materials to be teaching aids, tools that will help teachers convey information the adult believes the child must learn. The Montessori materials have a far greater function and scope. The knowledge children can acquire if they are free to follow their inner interests is unlimited, therefore the unique Montessori Materials are self-directed. This activates in children a desire to learn more, because it engages the child both physically and mentally. Each Material develops only one perception at a time. Every Material has a controlled-error component, which places the responsibility for finding answers on the child, rather than creating a dependency on the teacher. Montessori materials educate the child's senses, which makes him/her alert in adapting the knowledge received in school to the outside world. In short, the Materials are critical in rendering the child independent and self-motivated by allowing him/her to develop according to his/her own personality and rhythm. One of the many beauties of Montessori is that it provides the student a foundation that evolves into a life-long love of learning. What many parents do not know is that for a teacher, Montessori is a life-long learning experience. Through Professional Development programs and seminars at conferences Montessori teachers are continuously expanding their knowledge, having best practices and even learning new ways of guiding the students in their classroom. One of the other beauties of Montessori is that it is a dynamic, organic educational philosophy. Montessorians are constantly reviewing new research in all arenas from brain development to behavioral characteristics and discoveries of science so that they can better communicate with their students, their parent community and with one another. What teachers learn in Professional Development sessions and at conference seminars they bring back to the classroom and they share with their colleagues. Through the process of sharing, they perfect their understanding of this new knowledge or the new technique and they are able to apply it, always within a Montessori context to the students in their classroom. It is this openness to new information that creates the wonderfully supportive atmosphere in a Montessori classroom, where teachers are guides and observers who recognize that the classroom is a scientific laboratory filled with love for the child and for learning coupled with respect for new information as well as old, proven facts. In the spirit of science, the teachers are constantly blending their new knowledge and skills with the life-time of learning they have acquired as Montessorians. Each day in the classroom the beneficiaries of this knowledge are the students. And as they mature, because of their Montessori experience, they too will be open to learning new information. Equally important, they will be able, like a Montessori teacher, to weigh that information with an open mind and to determine whether it is fact or fancy. And after making that determination, they will know how to blend it into their current mix of acquired knowledge and share it with others. In so doing, they will be doing their part to better themselves and also to help better the world. The goal to better the world by educating the child is an underlying foundation of Montessori. It was a good goal 100 years ago when Dr. Montessori first stated it, and it continues to be valid goal for today. Every Montessori teacher and every Montessori student is playing their part in helping to achieve that goal.